"In clamours of all size, both high and low..."
The larger of the two described below. UFO enthusiasts get sort of ornery if you use the phrase “flying saucer” too liberally. This is because the strange craft they believe to be cruising about our skies come in a wide variety of shapes and sizes. To some extent, I guess I can understand that: if human beings were exploring some distant world, we’d probably take every vehicle from rowboats to tanks to aircraft carriers to zeppelins. Here are two examples of the extreme ends of the spectrum. The night of 10 February 1977 began in a pretty normal fashion for the inhabitants of Tucson, Arizona. Before the night was out, however, a hilarious burning munchkin from beyond the stars would inject a little levity into their lives. It all began around 7:30 in the evening when Lois Stovall, living in a home owned by her grandmother and located near an elementary school, spotted a shining object in the skies. Transfixed through the living room window by the object’s “strange beauty,” Lois and her grandmother went to the door to better watch the thing, which was zipping around at treetop level, circling the school and the Stovall’s home. Coming to a rest about 8 feet above the ground in their front yard, the Stovalls seemed unimpressed with the craft: it was something like a pill, about 6 feet tall and 2.5 feet wide, with a tall, clear window on the front. The light was shining from the inside of the craft, and consisted of a bright (but not brilliant) white light through which streamers of red and blue fire were flaring. The window had some sort of vertical bars in front of it, like a jail cell, and in the interior of the craft, amongst the glowing light and tongues of flame, crouched a figure “about the size of a four year old boy.” It wasn’t sitting down, so much as crouching, and appeared to be wearing what I’ve previously described as a Michelin Man suit: it looked as though it was inflated, puffed up around the joints, giving the impression that it was made with giant, air-filled donuts. 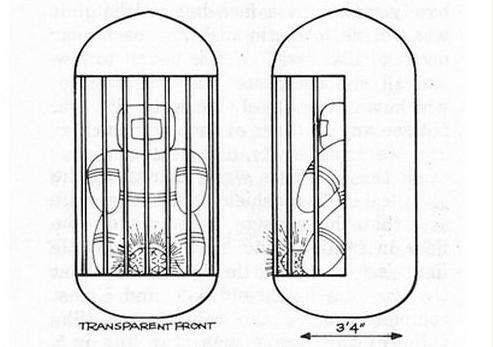 The creature’s face could not be seen, as he was wearing a helmet with a tinted glass faceplate. There was no instrumentation spotted in the vehicle. The amazing space pill flew around for a while, and a neighbor also reported seeing the craft. Three helicopters that had been hovering around the school nearby eventually chased the craft off, screaming by at treetop level. Two weeks later, another woman in the same town reported seeing a similar thing. It was shaped like a cross, however, two pill-like forms intersecting just above the center. The little man was inside, and at one point the “wings” disappeared, and it was back to the old, familiar pill configuration. The UFO enthusiasts are quick to mention that all of the local area’s helicopters were accounted for: therefore this is a clear case of either aliens flying around in what look like normal earth vehicles, or of our nefarious secret government having some sort of UFO involvement. There’s not really much meat to pick at on this case. It’s just someone’s story of something they saw: there’s no physical evidence, and they’re not making any claims that the creature said anything to them. That having been said, I think this is the first case of a burning, flying prison cell pill that I’ve heard of. I’ve frequently been told, and seen the theory forwarded, by UFO enthusiasts that all UFO encounters are pretty much the same. This one, however, is thoroughly unique, too unique to swallow. The Michelin Man suit shows up in other incidents on rare occasion; however, the craft, the flames inside the cabin, and the craft’s actions are a one-of-a-kind event. If I were the kind of person that took stories of outer-space shenanigans at face value, even I would put this in the ‘wait for further confirmation’ file; and since this occurred 30 years ago and we’ve not seen anything similar since, I think we can conclude that whatever happened back then, it had nothing to do with UFOs. On the other end of the spectrum, we have the floating nightmare factory reported by a woman in Mobile, Alabama. The reports I’ve read refer to her as Pat Norris, but that name is a pseudonym requested by the witness. Since we can give her any name we want, for purely personal reasons, I shall henceforth call her Frau X.
Frau X was driving down the road, happy as could be, with nary a worry in the world on a lovely spring evening. Suddenly, the sound of an explosion caught her attention, and the weather turned extremely windy like “during a tornado.” Her car began shaking so hard that she couldn’t steer, so she pulled off the road. After a while, and driving a little further, she came around a corner and spotted a huge object in the sky. She estimated the thing to be 80 feet tall and 210 feet wide. The thing floated along at about 5 MPH, and she got the impression none of the crew knew she was there until almost on top of her. She knew there was a crew because there was a huge (roughly 50 foot) window in the top, and on the bottom there was something that looked like the observation deck on a zeppelin. Her description includes a gigantic door in the front of the craft, as well as weapons turrets, but they’re hard to describe. Please see the image for more information. Anyway, she could see 30-40 people through the window on the top of the craft acting as though they were going through a “shift change”; they were about her height, had normal eyes, but giant foreheads with deformed ears. The crew on the bottom observation deck were peering out the windows, as though they were actively looking for something. The only sound as the craft floated above was the whipping of the wind and a loud speaker aboard the ship making announcements that were too muffled to understand. For some reason, there was a giant door made to swing inward at the center of ship. Inside, Frau X could see lots of construction equipment, including enormous I-beams; it looked like a half-built submarine, and she claims it could have been constructed not out amongst the stars, but here upon the earth. Eventually, the thing flew away. Frau X stated that upon seeing it, she became overwhelmed with a feeling of peace and giddiness, as though she were a happy child, and the reason that her description was so detailed is that she felt a strange, almost other-worldly, impulse to record as much of the incident as she could in her mind. If this was where the case ended, I’d say the same things that I did about the burning space munchkin. However, Frau X made a startling confession to the people investigating her story: before the incident, she had prayed every night that she would be contacted by space aliens. At this point, I don’t think I need to say much. The fact that the woman who spotted a bizarre spaceship had previously wanted nothing more in life than to spot a bizarre spaceship should be enough to dump this case into the file labeled ‘hoax.’ But it’s not. This is still put forth as a genuine spaceship sighting. Maybe I’m just too cynical. So there you have it. 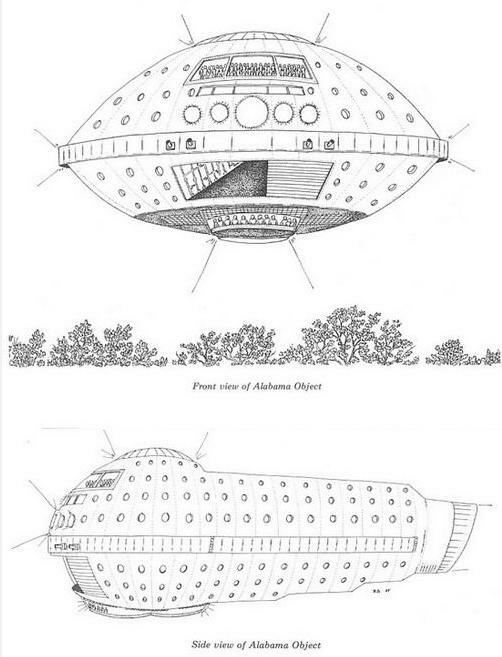 The next time that you hear someone tell you that all spaceship sightings are roughly the same, I recommend you blurt out “Humbug!” There is a wide, and insane, diversity to the stories, and they are not all as reasonable as the UFO enthusiasts would have you think.